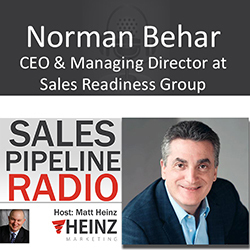 Host Matt Heinz discusses with Norman Behar, among other things, how to get a new sales manager up and running in 90 days or less. Norman Behar is CEO & Managing Director at the Sales Readiness Group and co-author of: The-High Impact Sales Manager. Brand-new sales managers are out to prove themselves, but few have the basic sales management skills. Maybe, eventually, they will read enough books or stumble on some of the right questions to ask, but in the episode, Norman Behar. This book draws on over 30 years of personal experience and our proven sales management training methodology. Hire the best people and hold them accountable. Manage sales performance by focusing on the underlying behaviors that drive results. Manage the sales pipeline and produce accurate sales forecasts. Provide personalized sales coaching that results in better skills and hire win rates. Lead, motivate, and inspire their sales team. Your sales team needs training that sticks. We've designed our training to create sustainable change in sales behaviors and improve results. Training programs are not single events, but part of an overall sales training system that will help your team produce better performance. 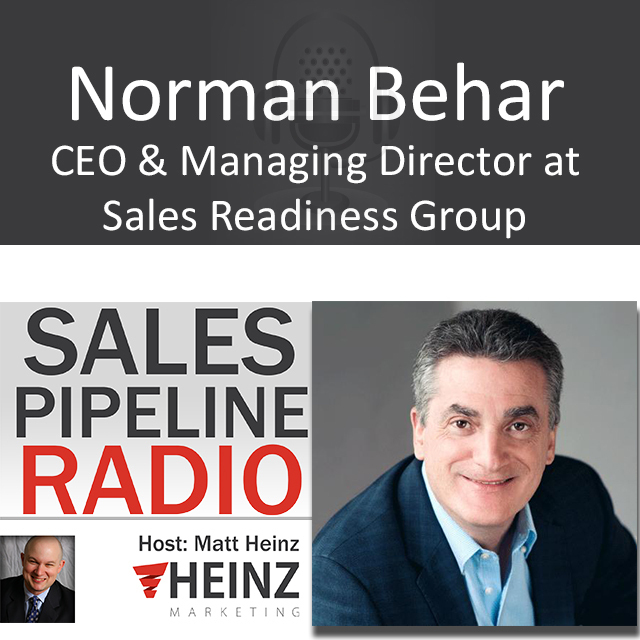 Joining us for this episode is Norman Behar, CEO & Managing Director at Sales Readiness Group and co-author of: The-High Impact Sales Manager.